The designer of a Jacksonville, Florida restaurant and bar, approached the team at Marker Technologies with a unique, one-of-a-kind, countertop fabrication. Jason, the owner of MT, has been in the solid surface industry for many years and has handled jobs with materials such as: quartz, granite, marble, 3Form, VCT and VET. Even with this extensive background, he realized that the these materials were not the right choice for the specific look and color scheme presented by the design firm. 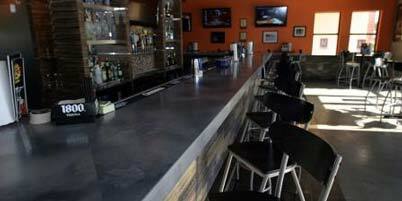 Custom concrete counter-tops became the clear choice for this fabrication. The team at MT had not created a concrete countertop before. Through the power of the internet, they searched for the latest technology in concrete and glass fiber reinforced concrete mix designs and formulas. In the end they choose the Xtreme Series GFRC system from SureCrete Design. Concrete is becoming a very popular choice for countertop fabricators in the USA. Concrete as a countertop medium, provides a blank white or gray canvas to create any color, shape or texture you can imagine. The Xtreme Series technology from SureCrete, the latest in concrete countertop mixes, takes concrete to a new manufacturer level. Xtreme Series GFRC is a preblended glass fiber, PVA fiber and Nano-Fiber cement based spray-able face coat. This material has been around for over 20+ years, it was only recently that the staff at SureCrete simplified the multiple component chemistry and blending process into a (1) preblended bag and (1) gallon of modifier. This material delivers a compressive strength of 10,500 PSI and can be demolded in as little as 6-8 hours. The hybrid GFRC formula is a high early strength mix delivering unparalleled flexural and tensile strengths, making concrete countertop fabrication lighter than ever before. This particular feature was very important to the team at MT. The job specifics for this concrete countertop was to fabricate a 115 square foot countertop with a stained finish. The edge profiles varied from 3″ exposed to the customer side, 2″ profile to the bartender side along with a 4″ wide 1/2″ deep drip tray. Although the profile edges were large, the average thickness on the concrete countertop was around 3/4 inches. Inside the 5,000 sq ft facility of Marker Technologies in Jacksonville, Florida began the process for creation of the mold for this project. With a tight deadline one mold was created and 9 concrete countertop pieces were casted. Once the pieces were demolded, they were cut with a water jet to ensure the most accurate and tight fitting 45 and 90 degree angles. The concrete countertop pieces were then stained with Eco-Stain, an Eco-friendly “GREEN” penetrating concrete stain. The finish desired for the countertop was matte. For this MT choose ARS 400, a thin film commercial grade concrete countertop sealer. 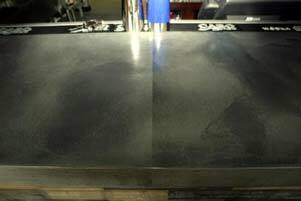 Marker Technologies had a fantastic first experience with concrete as a countertop medium. With NO formal training in concrete, he was blown away at the quality of technical support and ease of product. MT now has dedicated space in their Jacksonville, Florida facility for all future concrete countertop, wall panel, custom sinks and much more!